Although there are several things that differentiate Christmas in Germany from Christmas in the US, they both have one key character in common: That big red Coca-cola truck, decked to the gills in blinking lights and snaking across an icy highway to bring diabetes to snowy evening landscapes everywhere. But this year, the Alternative for Germany party, better known as the AfD, is trying to put the brakes on that red and white semi full of sticky awesomeness. Forget about the War on Christmas, this is the War on Cola. 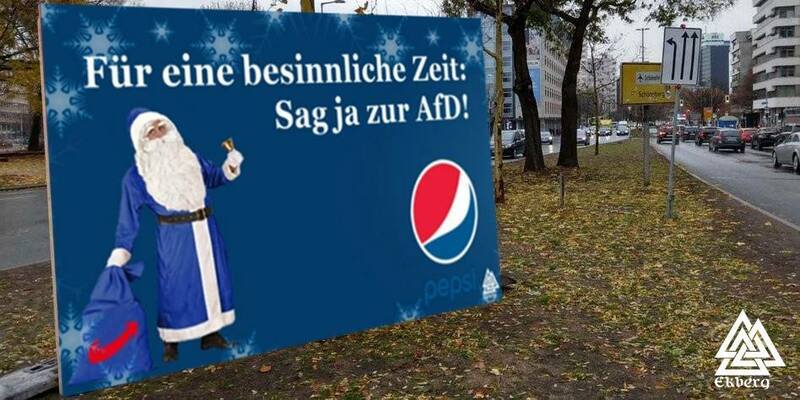 And so far it’s Cola: 4 – AfD:0. That’s because the War on Cola hinges on one thing: The AfD’s ability to be both reliably and relentlessly stupid. Photo from Matthew Borowski’s Twitter. “For a joyous season, say no to the AfD,” it reads. The poster looks real enough and many took to Twitter to congratulate Coke on its bold move, even though Coke had nothing to do with the campaign. 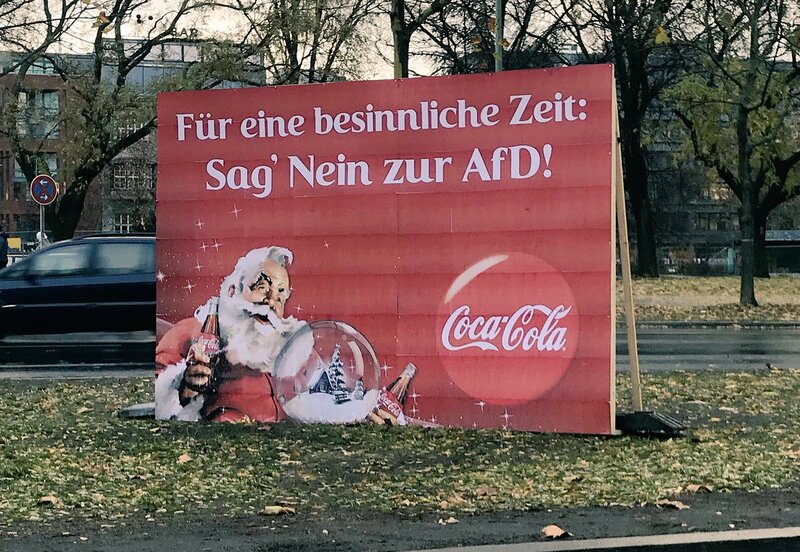 The modified poster with the coked up St. Nick apparently hasn’t even been used for several years, but it’s a subtlety lost on most people, especially the AfD. Its members called for a boycott and spilled the Coke they had already bought with their hard-earned reichsmarks. *despite me disagreeing with their politics, this human does illustrate the Teutonic ability to open a bottle with anything, something I’ve written about before. “Not every fake is wrong,” this tweet by Coke Germany spokesman Patrick Kammerer says, his words feeling like his product tastes: sweet. Photo thanks the leftist Volksverpetzer blog, because the original was erased. Pepsi was not amused – on Twitter the company said it rejected the “political commandeering of the Pepsi brand” by the AfD and that it would review its legal options. According to Volksverpetzer, the company behind the blue Santa (Widman costumes) also threatened to put some lawyers under the Christmas tree. For most observers, the War on Cola was getting flat, like that last bit of brown liquid at the bottom of a bottle that’s equal parts cola and backwash, but the AfD didn’t get to be the AfD by leaving brown backwash in the bottle. Malte Kaufmann, an AfD politician in southern Germany, tried to fire a shot across Pepsi and Coke’s bows by sipping a Fritz Kola openly on Twitter – If there’s a cola startup, then it’s Hamburg’s Fritz, which entered the market in 2003. “The only good alternative,” the tweet reads. Note the use of the word “alternative” and the BTW17 hashtag denoting the September 2017 elections where the AfD turned in a disappointing result. Fritz has had plenty of other pro-everyone ads and graphics, and reposted them after Kaufmann’s attempted cola burn. Quickly running out of colas to enjoy after a hard day trying to reintroduce fascism to Germany, one of the most problematic of the AfD’s problematic politicians got involved. The AfD is strongest in the former East Germany, so Bernd Höcke, the problematic politician, sought support from Vita Cola, a former East German brand. “There are alternatives for everything, not just in politics,” his tweet said. He pointed out that Vita Cola was the market leader in his native state of Thuringia, but Vita wasn’t impressed. I would post Vita Cola’s response, but it was the most vanilla of the bunch, saying they weren’t interested in politics — just being open and tolerant. Indeed, in their past they’ve used homosexual themes in their advertising. The only German cola left for the AfD to claim would seem to rule itself out by its name — Afri Cola. Indeed, a hapless AfD politician did try pull Afri in, and they also pushed back, but it allows me to end this blog with Afri’s bizarre, near-pornographic ads from the ’60s. Nuns? Realy? In any case, what German cola do you prefer?